On my last research trip to Terre Haute I had the great pleasure of conducting an oral history with my aunt Eileen [Chrisman] Ellingsworth. We discussed many things but some of the vignettes struck a chord. In particular she discussed how hard my grandparents work. Among them were several that described their daily lives. It struck me that they spoke evocatively of what daily life was like in West Terre Haute, and in many other towns in the 1920s and 1930s. As most of you have likely perceived, my family, like most in West Terre Haute, were not exactly middle class. Looking back upon things I think that if we fit into any social demographic, my family was best described as residing solidly among the working poor. Some in town were of higher status, some lower, but most shared that neighborhood where one took a deep breath and sported a furrowed brow on the day or two before payday dawned. Who relied on a tab at the local grocery store (like Tex Day’s Market) to put dinner on the table. Or were forced to borrow from family on occasion. Eileen has never forgotten “how hard your Grandma and Grandpa worked for us.” “Oh. Tim, they both worked so, so hard.” She talked about laundry day. My Grandpa Ray would get up at 5:00 in the morning, pull on his overalls and go out to start a fire. By the time dawn arrived he would have placed two large zinc tubs on the grate above the seething fire and carried bucket by bucket from the pump to fill them. It was laundry day. Only then would he head back into the house where Grandma would have breakfast ready for him and the kids. While Grandma would feed, change and dress my aunts and uncles, Gramps, on hot days, would go back out and soak burlap bags in cold water. He would hang these over the windows and front door of the house. The wind would blow through the sopping burlap providing a sort of primitive air conditioning. He would then walk up McIlroy Avenue to catch the interurban to his job in Terre Haute. He worked for Western Indiana Gravel (later Terre Haute Concrete Supply). He started as a driver and eventually became a stationary engineer. After years in the mines he traded coal dust for gravel and concrete dust. Over forty years of his lungs being assaulted. Once the kids would were settled Grandma went outside to start a long, backbending laundry day. Gramps had already set up her laundry rack. In the middle was a hand-cranked ringer. She would gather her supplies together. Laundry detergent did not become common until the 1920s so like most others she used a hard cake of lye soap. On one side of the laundry table she would fill another tub with the boiling water, place her washboard. Then would begin the toil of scrubbing diapers, bed linen, and clothes, her knuckles scraping the hard ridges of the board. 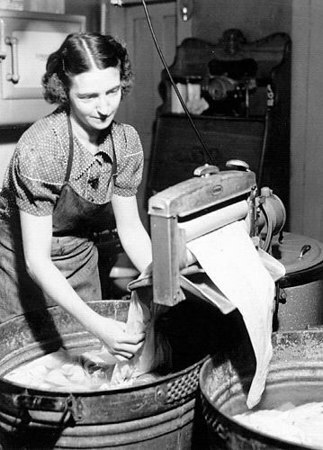 As each load was washed she would turn the hand-cranked wringer and pull the laundry into a tub with rinse water. After plunging them into rinse tub she put them into another rinse tub. Then, it was to the clothes line. Bending down each piece was lifted onto the line and pinned in place. This sequence was repeated many, many times, in between feeding and checking upon the kids. As she grew older Aunt Eileen would help. This happen once or twice a week, even during Granma’s many pregnancies (Grandma was pregnant 99 months of her life). If she was lucky, she would be done in time to begin dinner. If she did not have time, Grampa would empty all the tubs when he came home and maybe bring in the last of the dried clothes from the line. The next day would include sorting and ironing. There was no electric iron to help with this tiresome chore for years. She used a “sad iron,) an 8 t0 12 pound hunk of iron that had to be heated on the coal stove. As the girls, my mom and aunts Eileen and Doris, would take over some of this chore (none particularly cherishing this job). As with many during this era Monday was Grandma’s laundry day. But sometimes the weather did not cooperate and had to be done later in the week. If the laundry had to wait til Thursday or Friday, when it was done Grandma went to her part time job. The Bon Ton was a famous bakery/deli in Terre Haute. Her sister-in-law worked there. Two nights a week Grandma worked there. She did not work for money. She was paid in day-old bread or other grocery items to help feed the family. Her 13 or 14 hour day would end with her lugging sacks of food home on the interurban. I’ve mentioned the reasons for this surge before. It was built on and around land that yielded wealth to those who knew how to extract it. The coal, clay and gravel deposits made it a boomtown, just as gold, silver and lead had and would make towns flourish for a while in the west. 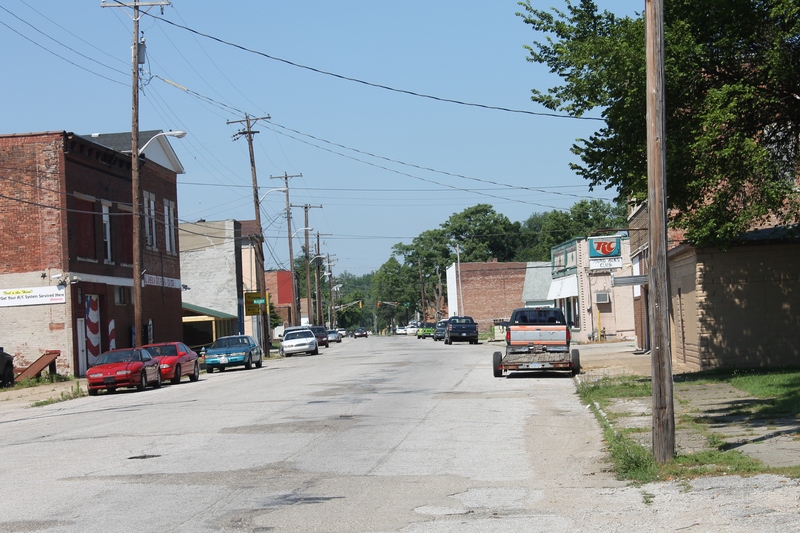 As with many boomtowns, West Terre Haute would fade and suffer. It would not quite lead to sage brush blowing across Paris Avenue, but decline it would. But for a decade or so, hope was something West Terre Haute’s citizens could breathe in on a daily basis. They believed that their scraggly spot along the National Road would become a vibrant, cultured, ideal small town. And they had their reasons for this sanguine outlook. They had seen just how far they had come, and they could foresee the bright decades to come. The townspeople, including my family, lived along dusted streets in a town that had changed only a bit since the Civil War. It was home to truck farmers, a few miners, and scattered tradesmen. Pigs, cattle and chickens were a feature of many yards in town. Saloons outnumbered churches and the town had a reputation of backwardness and more than a bit of sloth. Vaudeville comedians knew West Terre Haute was an easy mark guaranteed to make Terre Haute audiences laugh. Outside of the new mines that were beginning open, “industry” consisted of a few stores, a lumber yard, cigar factory, shinglemaking, and blacksmiths and wheelrights. But the next 15 years were ones of rapid “progress.” Outsiders opened mines and clay plants. one of the elements that doomed many a town was that capital investment was seldom centered in the town. Instead, it was the province of outsiders who came in, extracted all they could and then looked away. (ah, the socialist, lefty historian in me came out) The railroad expanded. The interurban system opened up new opportunities as cheap mass transportation allowed workers and customers freer movement. A new bridge and improvements to the “grade” between the towns made access to Terre Haute, and vice versa possible. Electricity came to most of the town. The telephone closed distance to the outside. By 1910 some of the main streets were paved (though it would be the 1920s before most neighborhood streets were paved and as late as the 1950s some of the streets in the far south of town were still dirt and gravel). Two newspapers were founded. The town began to advertise itself. 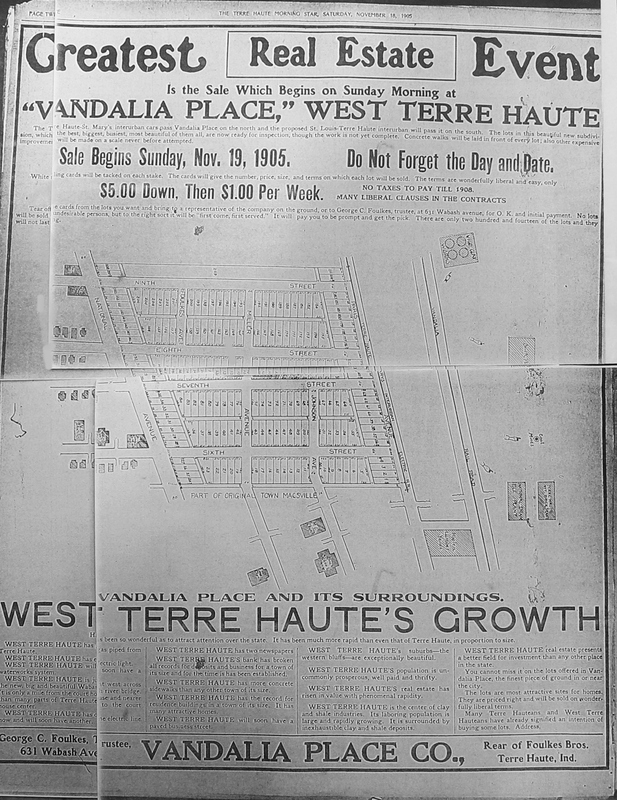 In 1905 issues of the two main Terre Haute newspapers featured paeans and features about West Terre Haute (no doubt paid for by the special ads featuring the town’s businesses). A year later a special supplement about the town was printed and circulated to boost the growing “wide awake” town of West Terre Haute. The town awaited its future. This 1874 plat basically shows the town as it was laid out by Samuel McQuilkin in 1836. 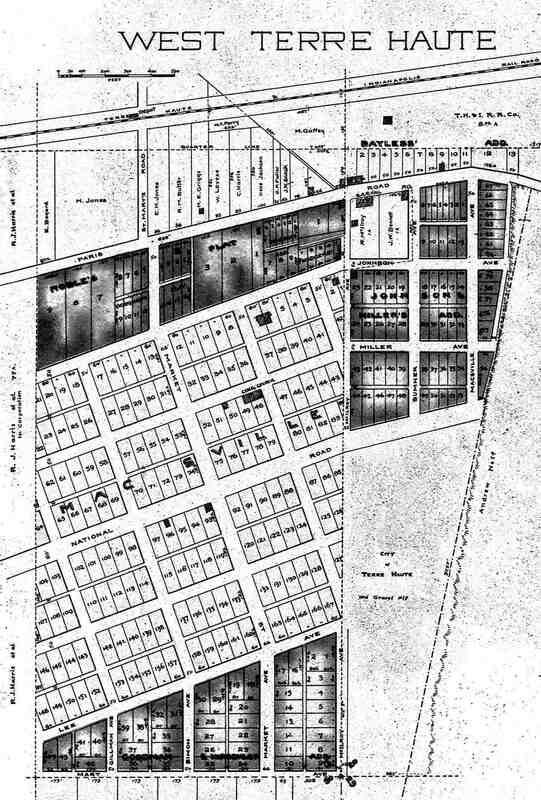 The town runs four blocks north and south of the National Road, and from present-day McIlroy Avenue to Fourth Street.. Not all of the neat plots were filled. There were only about 250 people living in town. It was a homogeneous population. They were mainly settlers who came from the upland South (like my forebearers, the Arthurs and Kelleys who were from Tennessee). There were likely no blacks, and most of the foreign born were from the British Isles and Germany. Coal mining was just taking hold, so most of the people were truck farmers, mechanics (blacksmiths, etc) or those who serviced the farmers. The above 1895 plat shows the first growth spurt. The population had doubled to 500 and subdivisions were added to the eastern, northern and southern fringes of town. 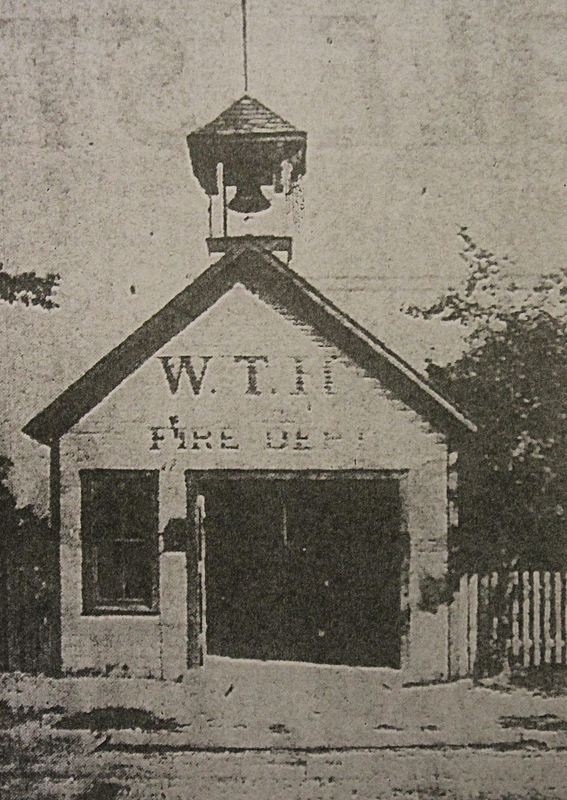 By this time, mining was becoming well established and it began the demographic change of West Terre Haute. Immigrants from southern and eastern Europe were the new citizens. Italians, Belgians, and Hungarians increasingly came to the area to work on the mines, bringing with them different languages and customs that clashed with some of the old stock. The terms bohunks, hunkies and wops were still being used to describe them when I was growing up. 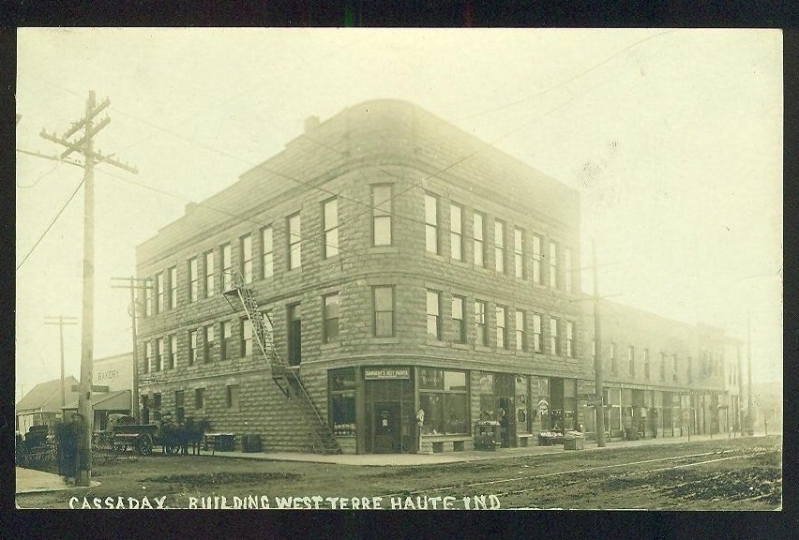 West Terre Haute land developers began constructing two and three storey buildings for businesses. This advertisement from 1905 shows a new subdivision being added to the plat. 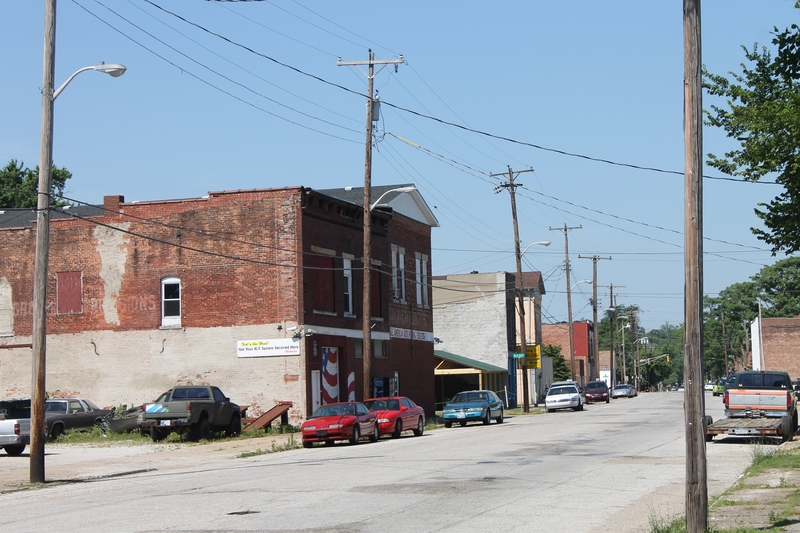 It would expand West Terre Haute closer to its present outline, pushing the northern half of the city to Ninth Street. Note the affordable pricing. It gave newcomers the chance to move to town and build their American dream. The “middle class” were to build substantial homes, but many of the mine or clay workers had to settle for less expansive housing, settling on 3 or 4 room houses or shotgun houses. I still recall 3 shotgun houses (and the thin, wiry people who lived there) in the 1960s that stood on the present site of the Post Office on Market Street. I have been been hoping to do some photo essays about West Terre Haute. I am working with lifelong resident Jim Plew who discovered a cache of photos from the 1940s. Those are still in the digitization process and we will bring them to you soon. Until then this modest beginning with a few graphics I have collected. Again, if any of my readers have photos from West T., particularly those showing street scenes or buildings prior to 1950, and wish to share them, please contact me. Remnant of first building in Macksville (West Terre Haute). Inside this frame building is the remnants of the log cabin that town founder Samuel McQuilkin built in 1833. It was common practice to build frame houses or building around the original log cabins. 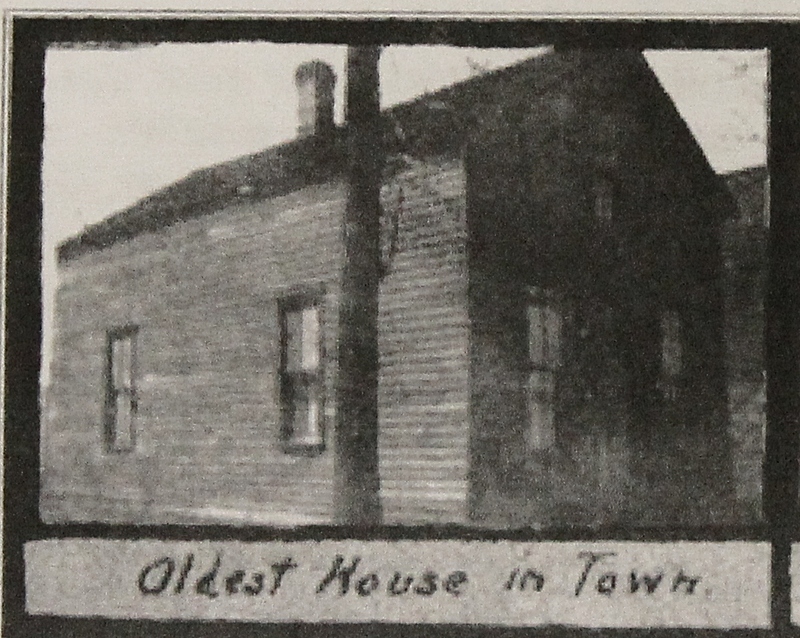 The house stood along National Avenue between current Third and Fourth Streets. This photo was taken around 1916. Of course the building is long gone now. Cigar making was a hand craft that required only skill, a few tools and a place to work. 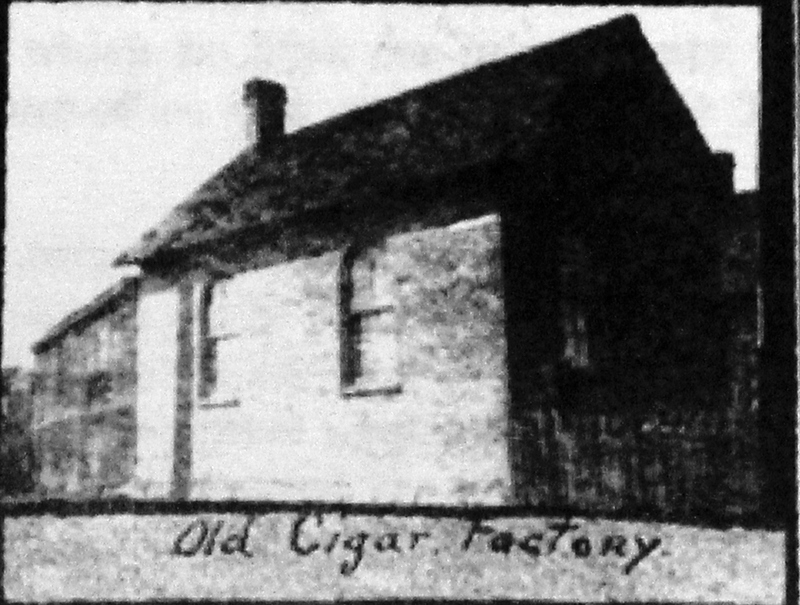 Like many other small towns, Macksville had a cigar “factory” employing a few men and women. From old records it seems that both my Hants and Chrisman ancestors rolled cigars as their living for a few years. Paris Avenue, ca. 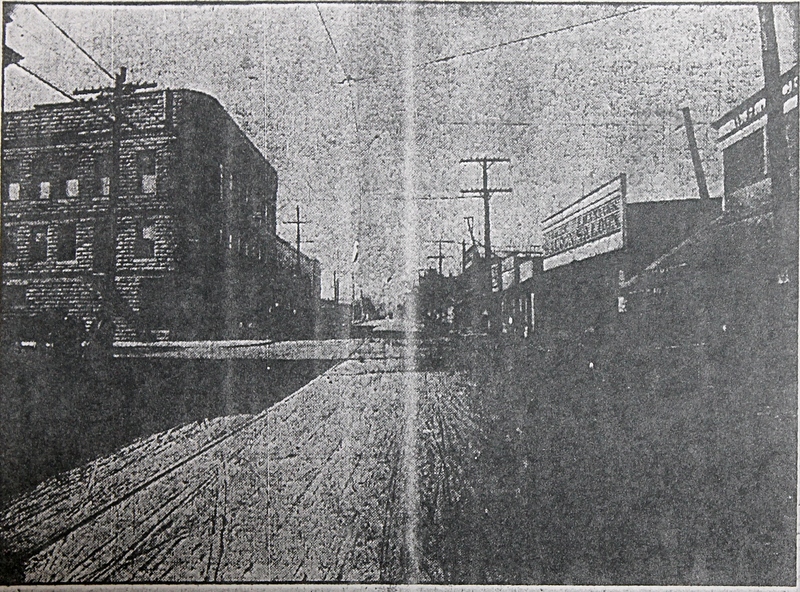 1911. looking east from Market and Paris Avenue. 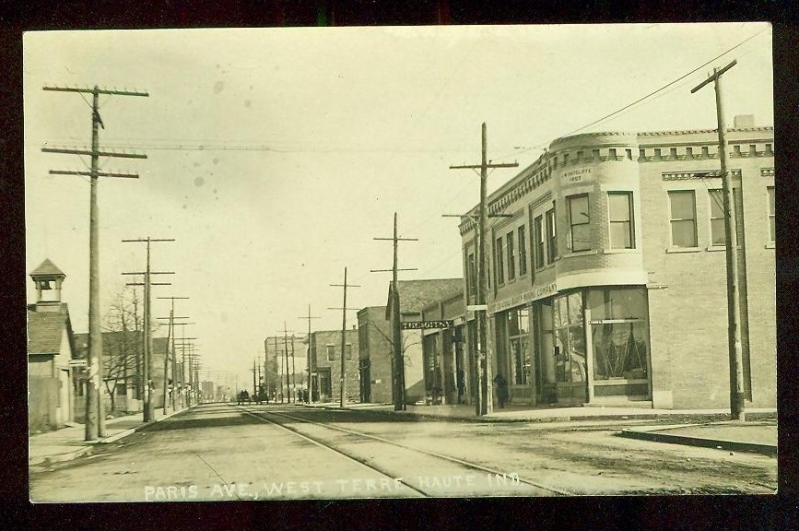 Paris Avenue was the center of West Terre Haute life until the 1930s. 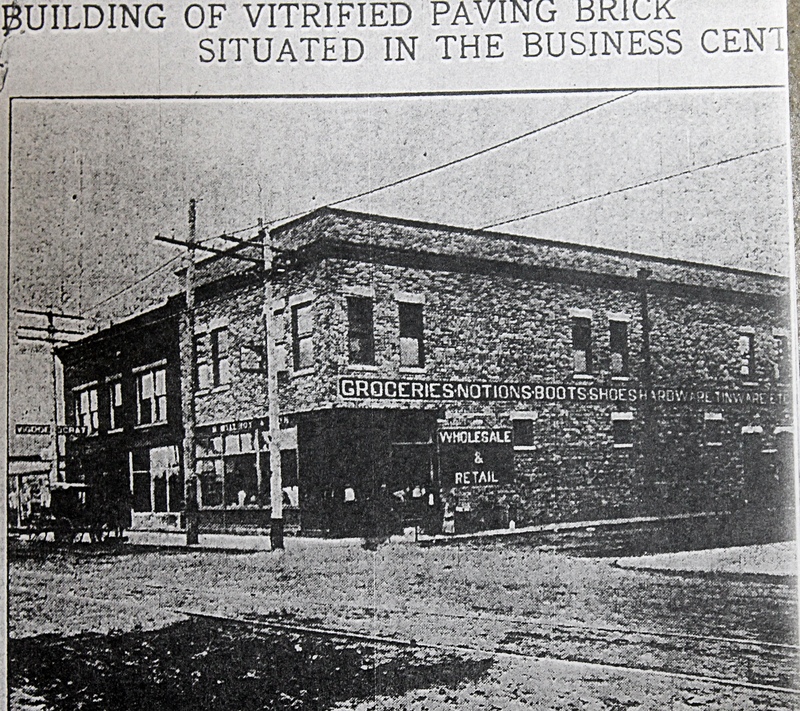 Then National Avenue (US40) began to gain ground. 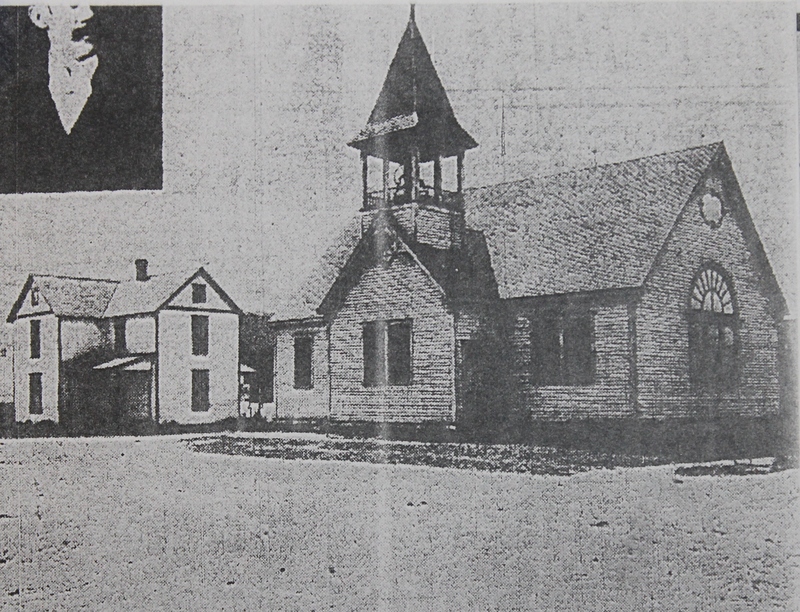 Paris Avenue was home to the bank, a theater, the mining company store and the telephone company. its array of bars and restaurants were filled with miners and others. 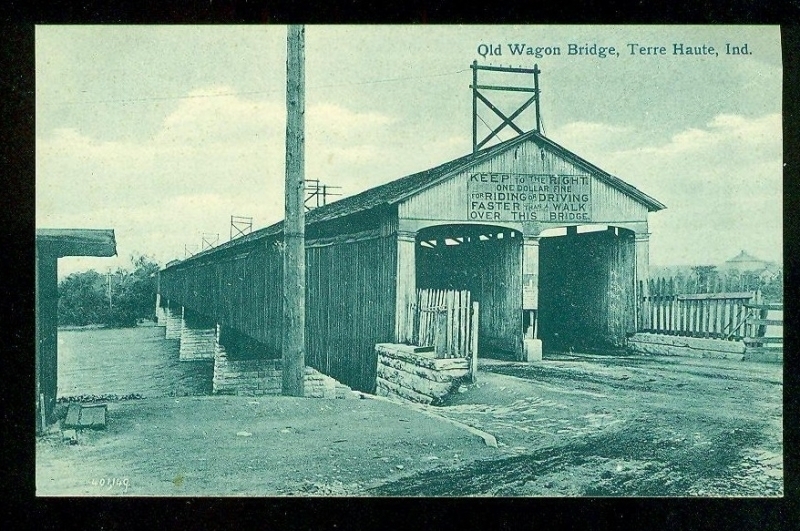 This was the second wagon bridge across the Wabash River that connected West Terre Haute and Terre Haute. It was used from 1865 to 1903. It was preceded by an earlier wooden bridge built that opened on Christmas Day, 1846. Prior to that bridge one needed a boat or ferry to travel between the towns.